Synthcurious were hoping that Bob Williams would be able to join us for the first Synthcurious event, but it wasn’t to be. 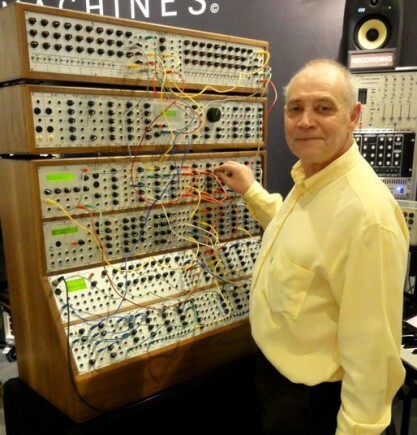 We are very grateful to Bob for taking the time to answer some questions, and to give us an insight into his time spent in Coventry and the formation of Analogue Systems. I was born on 13th November 1952 in Keresley Hospital and went to St Patricks primary school in Wood End, and then on to Bishop Ullathorne Grammar. I left school early (15 years old) having taken no exams and the nearest to being interested in music was a brief flirtation with the trumpet. Starting out as an apprentice electrician I realised I didn’t like the college side of things, so left to work in the Morris car factory on Stoney Stanton Road, then a fibre glass company out near Baginton Airport. By now I was drawn towards motorcycles and heavy rock music. It was at the fibreglass company one lunchtime that a song was playing on the radio which had a compelling sound where normally a guitar solo would have been used. The dj said it was Dave Dee, Dozy Beaky Mick and Titch with their new song Mr President, featuring a new instrument called the ‘Moon’ synthesiser. It really captured my imagination, but at the time the magazines like Melody Maker and New Musical Express made no reference to this magical sound maker, but eventually the name Moog was appearing, and the connection was made. So a trip down to Macaris in Denmark Street in London on the train, and then back to irritate the neighbours of the Walsgrave address I was living at! The EMS was very difficult to grasp at first and with no other synth owner in Coventry at that time it was a struggle to understand with endless expensive phone calls to EMS in Putney for advice. In the end I sold it back to Macaris at a great loss, and decided to work on a holiday camp in Cornwall (the year would have been 1975). The following year I worked briefly on the North Coast of Cornwall in a hotel before returning home and setting up a small motorcycle shop on the Foleshill Road with my best friend. Electronic music really wasn’t that popular, and it was the likes of Tangerine Dream and Kraftwerk, Hawkwind, ELP, Yes, that kept reminding me of synths, so I dabbled with a Roland EP20 electric piano, Roland SH5 synth, Roland RS202 paraphonic string synthesizer and a Vox Continental organ, but I knew I couldn’t play these instruments – I just liked making up new sounds. In 1979 after closing the motorcycle shop and selling the keyboards I did 3 more seasons in the Cornish holiday camp before deciding to move from Coventry permanently. During that time I had lived in Bell Green (very fond memories) Wood End, Foleshill Road, Walsgrave, Styvechale and Lentons Lane. I have fond memories of the Walsgrave Inn, The Red Lion, The New Inn (Foleshill Road /Lockhurst Lane). The only music shop at the time selling synths in the early 70’s was the Warwick Music Centre. They had an EMS synthi AKS and an Arp 2600, then a shop in Coventry got a Davoli synth, but mainly you had to travel afar to get what you wanted. Moving forward to 1987, and settled in Cornwall, I saw a Korg Delta for sale and thought I would see how synths had changed. After a mixed reaction I was introduced to a local chap who had a Roland Juno 6 which of course made me ditch the Korg and start getting proper polysynths rather than paraphonic ones. I bought new Yamaha TX802, Roland JX10, Yamaha QX3 and Roland R8 drum machine, just over £4500 if I remember correctly from a shop in Truro. I found them difficult to use, and when looking in magazines to see their resale value I was shocked and decided to try and trade them for pristine classics like Oberheim, SCI Prophet’s, Memorymoogs etc. I managed to do excellent trading and I am sure the musicians who got the latest gear were glad to offload their ancient gear to the “fool in Cornwall”. With gear lust now truly ignited I went to Guernsey and traded some of my spare classics for a Moog 3c which came back to Cornwall for restoration and was reviewed by Peter Forrest of A-Z fame, for either Music Technology or the Mix. Then Peter did an article for one of those magazines on my collection and I found myself importing the big modulars like Moog, Arp 2500, Polyfusion, Emu, Roland 700’s etc from all over the world and then trading or selling them to a small group of private collectors, one of whom was Martin Newcomb who built the jaw dropping Museum of Synthesiser Technology. In the early 90’s Robin Wood of EMS introduced me to a tech called Steve Gay, who repaired and serviced my ever growing collection, and by chance we shared quite a few things in common. One of these was the fact that his first synth was an EMS synthi AKS. He showed me some prototypes of a filter bank and a sequencer he had built and I asked whether he could design them for full production models. With Analogue Systems the name of the synth collection side of things, it slowly ported over to a manufacturing company, and in the early 90’s the FB3 filter bank was born and was very successful at the Frankfurt Show. The following year the TH48 sequencer was shown and that too was a hit! I was introduced to Dieter Doepfer by Matthias Becker at the show and was impressed with his Schaltzwerk sequencer and wished I had spent more time with him, but Matthias wanted me to see the new Waldorf Wave so I didn’t get the chance to talk to Dieter about ideas bubbling away back in the U.K. It is now around 1996 and Analogue Systems is now getting heavily involved with time spent at Martin’s Synth museum, so the thought of a fully blown affordable modular system is on hold. This is a time that if we knew what Dieter was also doing there could have been some conformity to create a euro standard, but when Dieter’s excellent A100 system became available we were still working on the rs90 vco and the rs60 adsr. The rs180 had been made, but the last 2 modules to make a voice were needed so we could sell the minisystem. By 1997 a fair few modules and 2 types of case were available, but the Doepfer catalogue was ever expanding and we concentrated on making sure our systems were doing everything they were meant to do. As the range expanded and being very much old school East Coast with a nod towards EMS we were successful in Japan, the U.S and of course the U.K but it was difficult in Europe due to the dominance at that time of Doepfer. A decision was made to make an up market range of cabinets in solid walnut as homage to the mighty Moog enclosures of the past as well as keyboards so the 8000 and 8500 series were released with the Demon keyboard as a controller. Then, through the association with Radiohead, an Ondes Martenot type controller was built called the ‘French Connection’ which was a huge success. Now we had found an excellent software programmer we could have midi modules developed and digital echo to compliment our all analogue bbd delays. Once a cv/midi was released we knew we would concentrate on just a few more modules to finish of the catalogue and the one we savoured would be the last one to be developed which is a homage to the KS section of the EMS synth A , the Roland SH101, and as a bonus a 12 bit sampler in the guise of the rs450 cv recorder. But, there was something that was bugging me, when they first came out I bought a Kawai K3 synthesizer which had an additive oscillator section that ran through an analogue filter and vca path. It was just a great synth for creating new tones but still have the warmth associated with analogue. This is where the rs370 came in to provide a modular K3 and with wavetable capabilities a PPG, and all you need do is put an analogue filter in the patching path to create dreamy pads etc. I started off being an analogue purist but came to realise that digital would have to be embraced by Analogue Systems, and although I should never say never, it seems like the journey for any more modules to be released may be over. With my failing sight I wont be able to patch my beloved system for much longer but have over 40 years of memories to reflect on and am pleased to have been involved with the analogue revival at the beginning. There are problems at the moment with blowing up modules in foreign power supplies and orientation of ribbon cables etc and in the late 60’s and through the 70’s – you could not put an Arp 2500 module into an Emu case or a Moog into a Roland 700 and euro rack has opened up the possibilities to mix and match within the same power supply and case and for some the DIY route which again is fraught with possible accidents. With Analogue Systems because our format is different as regards power connectors, it means that 90% of our sales are complete systems, and I doubt if we sell more than 200 modules a month to users who want to mix and match so we are very comfortable selling complete and properly calibrated systems to do the job they were designed for and slowly the new breed of manufacturers are making their own complete system also. I think there is a good 5 more years of modular growth before things slow down and in 20 years or so time it will be interesting to see what were considered the euro classics. I always wished I had gone into the Horizon Studios, which were across the way from the Coventry Railway Station, to see if they were interested in synths in the early 70’s. The Coventry sound was the Specials on the Two Tone label from what I remember but I do not know where they recorded. I don’t think I can put down any single highlight during my time with synths, but one which was unforgettable was the huge Phoenix system we built for Martin Newcomb, with additional 8000 and 8500 systems all patched up by David Goodman of Helpful Music playing Vidor’s Toccata.